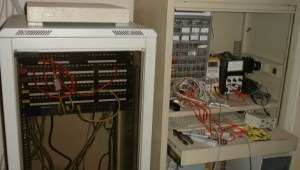 This is the wiring leading into Node 0. Wiring in what is now over 100 separate CAT 5 cables, some phone cabling and the home automation servers proved to be fiddly and very time consuming. 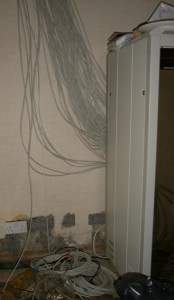 Cables are dropped down through a hole in the ceiling, and also up through a hole in the floorboards, and are terminated in the main rack cabinet. The cables are then run through conduit in the wall, with a groove in the conduit to allow the cable to be inserted into the conduit. At this point, there were still holes in the wall for another double power socket, a coax point, and a 4 port network socket, and random stuff was dumped on top of the rack. The home networking/home automation 19" rack (otherwise known as Node 0), before the rack mounted servers were fitted into the 19" rack. Next to it, is the electronics workbench. The SUN Sparcstation 1+ sits atop the 19" rack on the left, and the random stuff has been removed.